Pennsylvania Gov. Tom Wolf released a statement after the Environmental Protection Agency's (EPA) final Clean Power Plan was released on Monday. 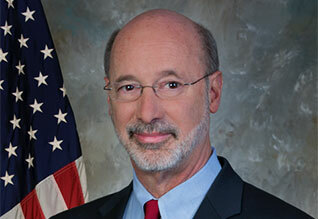 Wolf said the new regulations can become an economic driver through the energy industry. The Pennsylvania Department of Environmental Protection (DEP) will let stakeholders and the public provide input so that the agency can develop a plan that will help the state's economy while adhering to the power plan's guidelines, Wolf said. "Pennsylvania is a leader in energy, and we need to do everything in our power to advance the next generation of energy production while protecting jobs in Pennsylvania," Wolf said. "Clean coal is part of our energy portfolio, as is natural gas, solar, wind and other sources of power, and all of this has to be part of a comprehensive strategy. My administration looks forward to working with industry leaders and legislators, as well as citizens, to find the right balance and develop an effective and responsible state plan." The Clean Power Plan has set regulations on the amount of carbon emissions that are allowed to be expelled, aiming to cut carbon emissions nationally by 32 percent by 2030. "Cutting pollution from power plants, utilizing natural gas, supporting nuclear power plants, increasing the amount of renewable energy in Pennsylvania and improving energy efficiency statewide all can fight climate change and be an economic driver," DEP Secretary John Quigley said. "When our businesses upgrade power plants, install solar panels or improve energy efficiency, that's a win for the environment and a win for Pennsylvania's economy."